My Mum hates milk. She can’t stand the stuff. The smell of milk is enough to start her retching. She won’t use it in anything, and only buys milk for guests to use. This makes milk in her house all the more dangerous, as the small unused portions of milk lurking in her fridge go off. Why does she hate milk? Well, she blames the government scheme that provided milk to all Australian school children. My Mum grew up in Sydney, and to be fair, her memories of school milk sound pretty awful. Every morning about 9am, a small bottle of milk – 1/3 pint, to be precise – would be delivered for each child. The milk would sit there (in the sun) until morning recess, when each child would get their very own (now warm and possibly slightly off) bottle of milk. 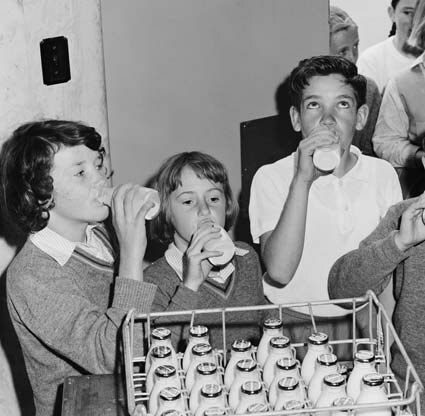 This milk delivery happened nationally from 1950 through to 1973 in most creches and primary schools. Given this length of time, and number of school children involved, I don’t imagine that my mother is alone in her milk phobia. So why was all of this fresh milk being delivered? It was largely a public health scheme – aimed at improving the nutrition of Australian children. Similar schemes were being run in Britain and New Zealand – there was a great deal of concern in these post-war years that young children weren’t receiving a balanced diet. In 1944, an Australia-wide nutritional survey had found that most Australian households were consuming significantly less than the recommended daily intake of calcium. 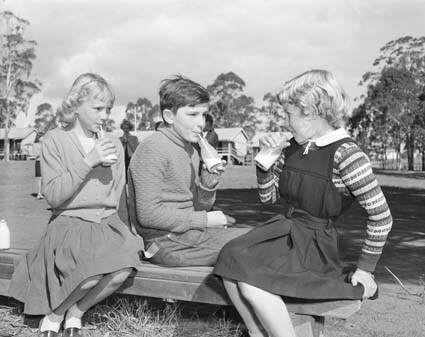 Some Australian States had been running their own free milk schemes independently – but in February 1950 the Commonwealth Government decided to centralise the scheme so that (in theory) no child under the age of 13 would miss out. It also helped, of course, that several Australian states had milk surpluses – the milk purchased by the Commonwealth Government for school children would be a very welcome source of income. If you flick through to the 134th page of this file, you can read Earle Page’s speech introducing the original bill. It gives a snapshot of the medical surveys and recommendations that led to the free milk scheme. Fast forward twenty years to 1970, and the scheme was still running – nearly an entire generation had been given milk that they would not have received at home. My mother’s experience tends to indicate that the children themselves were less than grateful for this. The Federal Cabinet reviewed the program in 1970, and their decision to continue with the free milk scheme can be found here. More interesting notes on the submission can be found here, where you can see queries about whether milk’s medical benefits had been proven, and whether giving children warmed milk that they hated was a good thing. The Cabinet found that costs had risen substantially – providing the milk had cost $72,000 in 1951, whereas it had grown in cost to just over $10,000,000 in 1969. In 1969 the scheme used 12.4 million gallons of milk, which was then about 3.4% of liquid milk sales. To stop the scheme at this stage would have been a blow for the milk industry – and therefore was a major consideration in the recommendation to continue the scheme until 1980. 1980? But it didn’t go that far… I started school in 1974, and I never received free milk! 1974 was in fact the year that the scheme changed considerably. By then it was projected that the scheme would cost $12 million and the decision was made to supply fewer schools in order to reduce the costs to $5 million. Preference was given to children with disadvantaged backgrounds. So I never had free milk at school – which may explain why I rather like the stuff. This entry was posted in 1950s, 1960s, 1970s, nutrition and tagged food, milk, school children. Bookmark the permalink. The free milk was no doubt meant to supplement the Oslo lunch – I wonder whether there are any records on the introduction of the Oslo lunch? I remember the milk! Fortunately I only had 1 year of it as I started school in 1972. Was always too cold in the morning and too warm in the afternoon. One of my treasured memories at primary school in Sydney during the 60s. How I looked forward to guzzling down those little bottles of white gold, I say bottles, there was plenty to go around and no point in wasting all that cud chewing. The crates were positioned under the shade of large gums, we helped ourselves, bottle caps were saved for craft. We didn’t need the milk, plenty of good nutrition at home, it was just a lovely bonus. Milk is still my favourite drink! I particularly remember the cream on top starting to go yellow from the crate sitting in the sun.